When we need images beyond a digital x-ray, we use our CBCT technology to create a 3D image of your teeth, gums, and other soft tissues. 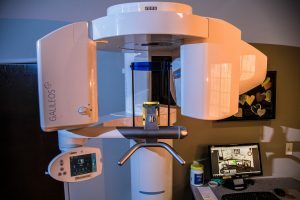 CBCT stands for “cone beam computed tomography” and helps us make a diagnosis, examine bone structure, plan oral surgery, and accurately place dental implants. An accurate diagnosis is the root of all success when treating patients. CBCT is the tool that many times provides the information for that diagnosis. Imaging with CBCT is similar to digital x-ray. You’ll be asked to sit or stand while a device rotates around your head taking images from all angles. The entire process takes 30 seconds, and radiation is a fraction of traditional x-rays. If you’re considering implants or dentures – schedule your free consultation (CBCT and digital x-ray included!) to learn more about how CBCT can benefit you.